I think I succeeded! These cookies were simply delicious. And if you don't have candy corn, no worries, they work well with a variety of toppings and or additions. I also made some with chocolate chips and almonds, even better! By the way, I owed a friend of mine a thank you for a favor, so I wrapped up a few of these cookies (as pictured above) and they were a hit! I think these cookies would be perfect on a festive plate set out for Santa, so I sent the recipe over to Susan at Food Blogga who is hosting a Food Blog(ga) event called Eat Christmas Cookies, Season 2. So if you're thinking about making cookies for Christmas, check it out. You'll find some great recipes of Christmas Cookies From Around The World! Blend cream cheese, butter, oil and milk with an electric mixer until smooth. Add sugar and almond extract; mix well. In a medium bowl, sift together flour, baking powder & salt. Add to cream cheese mixture; stir until blended and smooth. 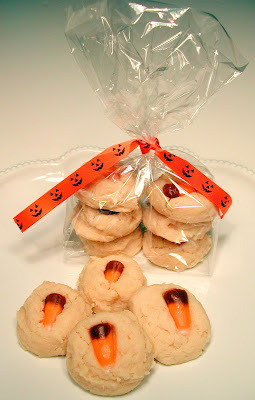 Drop dough from a tablespoon or cookie scoop onto parchment lined cookie sheets. Top with candy corn, chocolate chips or sliced almonds. Bake 10 to 11 minutes or until set but not brown. Cool for 10 minutes on baking sheet and transfer to wire rack. I love cookies & your recipe just sounds tempting. YUM! I bet you could garnish these with any seasonal candy and they'd be great! 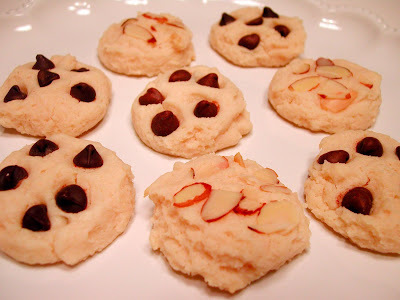 ooh, cream cheese cookies... these might have to get added to my list! Love the looks of these!! These are made with reduced fat cream cheese? Oh, bless you, Annie! I love them! It's officially Christmas cookie season!